If you've taken a big leap and are a beach hut owner who hires out their beach hut then firstly - well done!! Having navigated the tricky world of checking insurance, ensuring the contents are right and advertising your beach hut, your beloved hut has already welcomed it's first paying guest. Do you remember that proud moment and nervous feeling of first guests? It was exciting but also ridiculously scary!!!! I'm sure I was glued to my phone that very first day like a proud parent. A few weeks pass by and whilst you didn't expect it to sell out on day one, it's been slow. When you look around at other beach hut hire companies, you can't understand why they are having so much success. You are disappointed that you've put all this hard work into the beach hut of your dreams and can't quite understand why no-one else sees that. Surely they see how much fun they'll have and that your beach hut is actually the BEST!?!?!? But wait a minute, other beach hut hires are also charging more per day - how does that work? Why is your beach hut not fully booked? I can help you find out. Demand is by far outstripping supply of beach hut hire. In my first year of opening, both beach huts were fully sold out during all school holidays and several weeks in advance. I could have resold several dates over and over again. I have loyal customers who come back time after time and even over Christmas! Again this year, our bookings are exceeding expectations and we're on track to sell out pre-summer. I'm already turning away guests for weekend dates and thus can't understand if the demand for my own is so high - why are you also not full? There are several quick wins that you could implement to have the same success and if I can do it, then I'm sure you can too, in a way that suits your style too. Whatever your reason for hiring out your beach hut, whether you just don't get to use it enough, circumstances have changed or looking to keep the beach hut affordable as licence fees increase each year, I can help you. By working together in just a very short amount of time, I can ensure you are successful and maximise the income you make from your beach hut. Equivalent to just 2/3 extra bookings this year, I can offer you my expert opinion on the main aspects of your Beach Hut Hire. 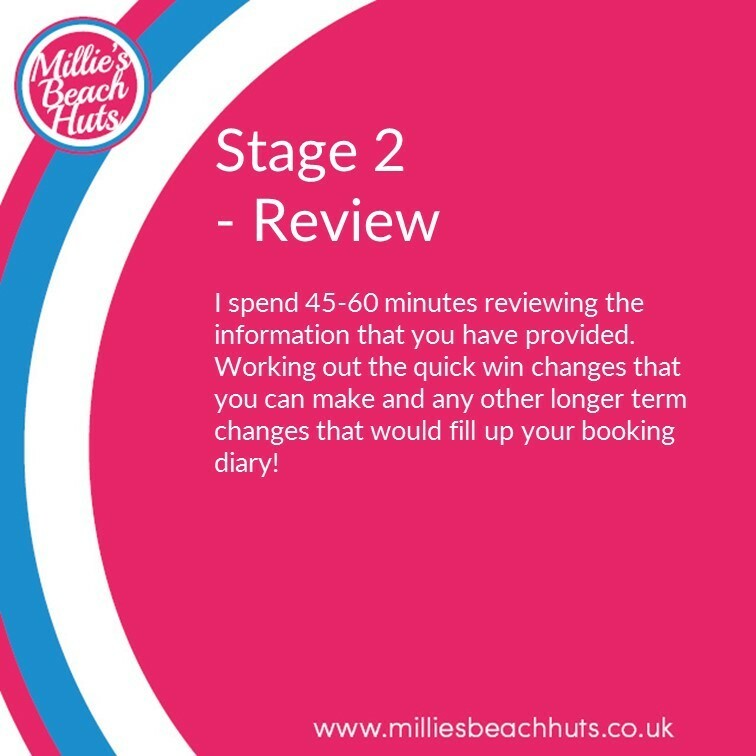 From your Beach Huts 'attraction' factor through to how you advertise and market, I can help you make that change in time for summer 2016. I’m going to open up my availability with the promise that we can schedule both calls within a one week period. Just click on any of the stages which will take you to a payment page and you'll then receive an email with the ability to book your calls. 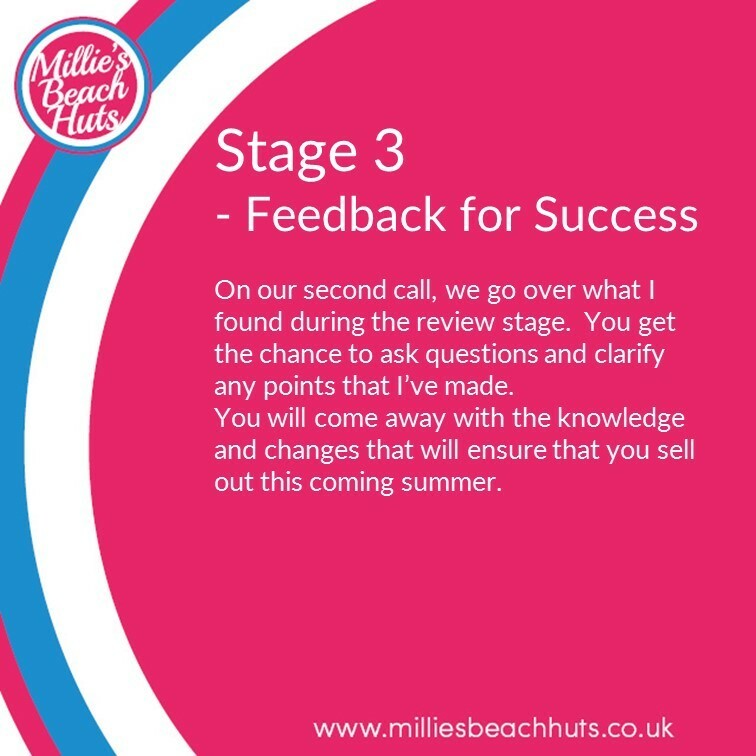 I can't wait to work with you and help those mums desperately seeking their ideal beach hut and just haven't yet found you!